The training has had a major impact on both my group classes and private sessions. This training has helped me make sense of the various and disparate anatomy trainings I have had throughout my yoga career. The approach was clear and helped train my eye to read bodies, notice suboptimal patterns, and offer holistic approaches to help my students be at peace in their bodies (and minds). Just as importantly, I am now able to easily understand and converse with my clients’ physical therapists, body workers, and doctors. It is trainings like this that raise the caliber of the yoga profession as it empowers yoga teachers with the knowledge and understanding to add to the conversation when it comes to our clients pathways to healing. Each time I plan a class I can clearly see the influence of the Method on the structure of my class. Among other things, it has helped me realize that some of we do in the asana practice is not necessarily biomechanically sound. I can now approach the yoga postures with a keener sense of what is healthy movement for all different body types. The course exceeded my already high expectations. The program that they’ve created not only teaches us to read bodies and movement patterns the way some other courses do, but goes far beyond that by teaching us a way of assessing, testing, strategizing, prioritizing, releasing, stabilizing, re-testing, and then expanding upon that. Helen and Diana strike this beautiful balance of giving you a structure, a game plan, if you will, and knowledge about common patterns, and yet also tons of space to consider all possibilities and the openness to the fact that all bodies are different. The course is beautifully organized, broken up into digestible chunks, i.e they present material while asking questions to engage us in critical thinking, then explore it working with partners and groups. We had to design a class plan based on the material or a private session tailored for someone with that specific issue. As a long-term yoga practitioner, RYT and Occupational Therapist (OT) working in hospitals and assisted living facilities, I often found myself incorporating yoga into interventions with my clients. Giulia’s Theraband workshops have been so informative and inspirational to me as a yoga teacher, and more importantly my own personal practice (as I recovered from an injury). These workshops have helped me to better understand how to incorporate more strength, stability, and mobility, and at the same time to find more ease and lightness in all my asana postures! I walked out of these workshops feeling stronger, taller, lighter, and more spacious! I now bring a resistance band (or two, or three) to all the yoga classes that I take! I love using them in my own practice to find more engagement in the poses. I love the genius of Giulia Pline and how her inspiration and creativity originates from a functional movement perspective! I recently took a banded exercise series with Guilia Pline who has studied extensively with and has an advanced teacher training through Threes Physiyoga . As a physical therapist I work with both stiff, inflexible clients and hypermobile patients. I loved using the bands to explore and sense how to stretch into one’s end ranges safely or to impart stability through increased awareness and enhanced banded stability. These class were amazing! I appreciated the stacking of the body to optimize movement, breathing and alignment. Guilia really had some very useful cueing to enhance my yoga postures and practice and I felt safe, informed and was able to move with more ease as a result. 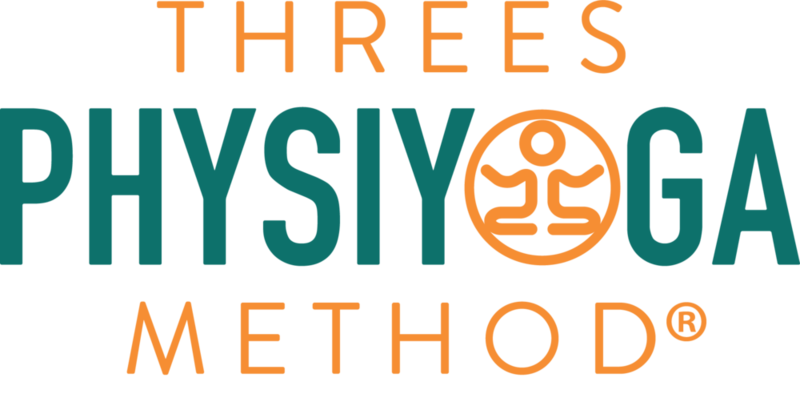 As a physical therapist, I really appreciate the biomechanical movement assessment as well as the alignment cues to perform yoga safely and I highly endorse the brilliant insights and guidance of the Threes Physiyoga Method Approach.